Jericho: What in the good name of Jeffrey Dahmer is up with the musical bit at the beginning of the movie? Gohan and Icarus shaking their asses to Middle Eastern music was perhaps the greatest scene in the history of DBZ (if you're high out of your mind), but...what the hell? And then we get this badass rock music that kicks in as a METEOR FLIES IN... already this movie has more music than the first three. After the meteor crashes, my first thought is "well, that was a short movie." This movie features The People of Earth, who only occasionally show up in DBZ. There's a reason for that: The People of Earth are incredibly stupid. "Ha ha, I'm not afraid of a guy named Lord Slug!" "Slugs are gross!" Yep. If there's one constant throughout DBZ, it's that the common people are about as intelligent as boulders. You know what? I wish Buu had been just MARGINALLY smart, because that's all it would have taken to win. Boom, show over. Everyone's happy! 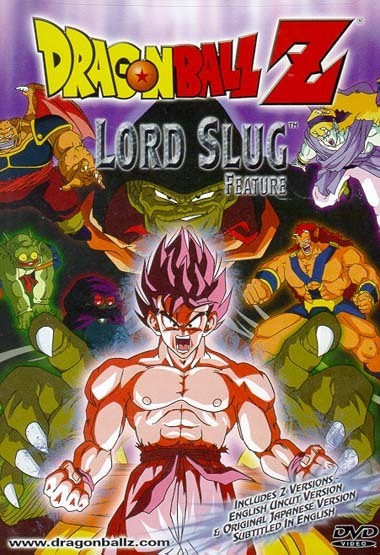 Lord Slug himself is a total punk. I'm surprised he never took on Freeza, since he probably could have given Freeza a decent challenge and since he's a Namekian. Then again, he probably couldn't care less about his home planet. Turliss also probably could have given Freeza a go once he ate a bunch of fruit. ...what am I going on about, none of these guys were really all that canon. The most noteworthy thing about this movie is the abundance of licensed music. When "Stupify" by Disturbed started playing in the middle of a battle, I nearly fell out of my chair.